Starfleet's most prominent Klingon Lt. Worf is commonly considered the toughest crew member of the Enterprise. That's why it's kind of odd how many times he got beaten up on the series. The real reason he often got his tail handed to him is that it was an easy way for a new enemy to show how tough he was. "The Borg are so tough, they can even take out Worf!" This phenomenon is known as the Worf Effect. Check out this compilation of the many times Worf got slapped like Charlie Murphy. What do you think of the video? 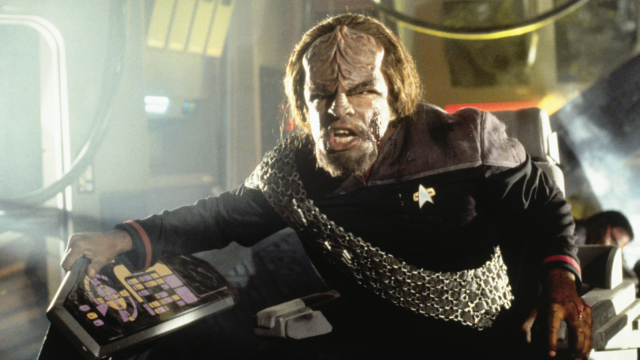 What other TV shows and movies have the Worf Effect? Considering he was head of security, he never really go to fulfill that role. He did get beat a lot. He fared better in DS9 though. He had the same issues that a lot of tough guys in comic books have to deal with... they have to get their butts kicked to prove the situation is serious. Poor Klingons are everyone's punching bags. I still wouldn't want to mess with him! I am so glad this is a known thing - my friends and I talked about during the first season when the old worm controlled Admiral laid him out - and then that same scene happened time after time after time - we never called it the Worf Effect though. If only they'd remembered to throw in an occasional moment where Worf showed he was tough by opening a can of Whoop Katagh on someone successfully! I've never liked scenes where the tough guy has to get beat down, then makes a sudden come-back. Its always a let down. "Worf Effect"; brilliant. It's different when the guy being hit can take the punch. It's also much, much different when Worf feels free to hit back. Can you say, "Today is a good day to die"? he just liked to let his klingon side out, just took a beating so he got to fight more... it was not win or lose, it was battle. awesome... thank you for the caption win, i needed a boost. vader caption: off camera what you don't see... he is hitting a deathstar turn table... and you can hear "wiggity, wiggity, wiggity wack"! !